Tuscany to Santa Barbara, create the distinguished styles of homes at Crystal Cove. 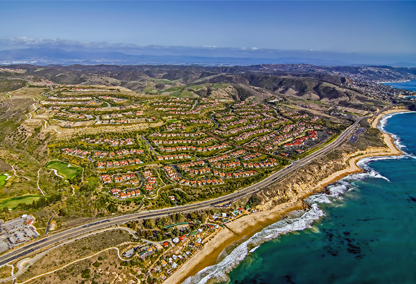 One of the newest urban developments in Southern California, Crystal Cove is near the ultra-luxurious Resort at Pelican Hill and a 36 hole championship golf course which is ranked the No. 1 Golf Resort in the World by Condé Nast Traveler. It is also near a shopping plaza with an ocean views beset with an array of world-class restaurants, many with views of the Pacific. The community is bordered by 3,674 acres of permanently protected open space, including Crystal Cove State Park, Los Trancos, Muddy Canyons and Laguna Coast Regional Park. Crystal Cove is situated between the beach and the inland wilderness area in Crystal Cove State Park. The park incorporates 3.5 miles of beach, the historic Crystal Cove beach colony and 2,791 acres of wilderness area in the canyons. 53% of Crystal Cove is dedicated to parks and open space. Crystal Cove has a total gross acres of 805. The community will have approximately 653 semi-custom homes and 131 custom homesites when fully developed. These approximately 131 custom homesites range in size from 16,000 to over 35,000 square feet. Crystal Cove is a Tradmark of the Irvine Company. Santa Barbara: The Santa Barbara style, as the name suggests, emerged in Santa Barbara in the 1920’s and 30’s when the community established itself as a prestigious winter resort attracting wealthy residents from the East and Midwest. It is an eclectic mix of Mediterranean styles with fragments of Spanish, North African and Mexican architecture unified by the use of clay tile roofs, expansive stucco walls and deeply recessed windows. These were added to capture ocean views and to complete the overall romantic effect of the architecture. Tuscan: The Tuscan country house is distinguished by the use of Roman pan clay roof tiles and exposed heavy timber rafter tails with decorative end cuts. Shutters tended more often than not to be louvered and painted a deep Tuscan red or dark green. Exterior walls were constructed of stone, sometimes interspersed with brick at door and window openings and building corners. Exterior walls, if plastered, tended to be warm, and sometimes color, earth tones. Provence: The country house of Provence, France, is a style derived from medieval country homes. The geometry of the architecture is simple and additive. Exterior walls were constructed of local fieldstone with dressed stones at door and window openings and building corners. The walls may or may not have been plastered. Plaster colors tended to warm, and sometimes colorful, earth tones. Windows were frequently accented with colorful solid board shutters.The roofs were shallow pitched and constructed of earthen colored clay tile with the characteristic stacked-tile Genoise eave. Northern Italian: The Northern Italian architecture, sometimes described as “Italianate,” depicts the generic style of the country villas scattered throughout Northern Italy. Italianate architecture is characterized as formal but simplistic in form, a departure from the Tuscany style of a rustic country home. Red-tile roofs, walls of stucco or stone covered with stucco, symmetrical with regard to massing and window/door placement, low pitched roofs adorned with frieze cornices and brackets, and spacious interiros, characterize the style. Crystal Cove residents enjoy many Sought-After Amenities. Ocean Garden: Residents also have access to the Ocean Garden, with views of the land, sea and sky. Exotic plants are reminiscent of kelp, sea urchins, jellyfish and sea anemones, and magnificent coral trees provide shade. Abalone shells line the path of the View Terrace, which looks deep into the blue ocean below. Ocean Garden is the perfect place to unwind. Island Garden: With stunning views over the Pacific Ocean to the islands of Santa Catalina and San Clemente, The Island Garden at Crystal Cove offers the ideal setting for a couple or small group to enjoy a picnic or classic Southern California sunset. The park features a lush, crescent lawn and landscaping that matches the native plants on the islands in the distance. Sidney Bay Tot Lot: With a colorful jungle gym and wide-open spaces for endless somersaults, the Sidney Bay Tot Lot allows residents to play with their young children and mingle with their neighbors. Reef Point Park: Reef Point Park provides residents with yet more outdoor enjoyment, including a children’s playground, covered barbecue area and a half-basketball court.